Showcase an album by creating a promo with your WAV or MP3 tracks, photos, PDF attachments and YouTube videos. We automatically generate a professional looking web page for your promo and you can customize the way it looks. Import your contacts and organize them into strategic groups. Give people instant access to your promos or send them an email invitation. Haulix generates a special link for each outgoing email. Your contacts click their unique link and access your promo. Monitor listener engagement in real time from your dashboard and track promo results with reports. Review feedback and better understand how your listeners are consuming your music. Our industry traction can help progress your industry relationships. Your Haulix dashboard displays all actions performed by your contacts and team in real time. You can see who is streaming or downloading your music as well as overall performance for each promo. The dashboard is great for keeping a pulse on engagement. Every email blast you schedule has its own statistics screen where you can filter results and see each recipient and whether they opened the email. View track by track how many times they streamed and/or downloaded and easily send bulk follow-up emails to encourage further engagement. 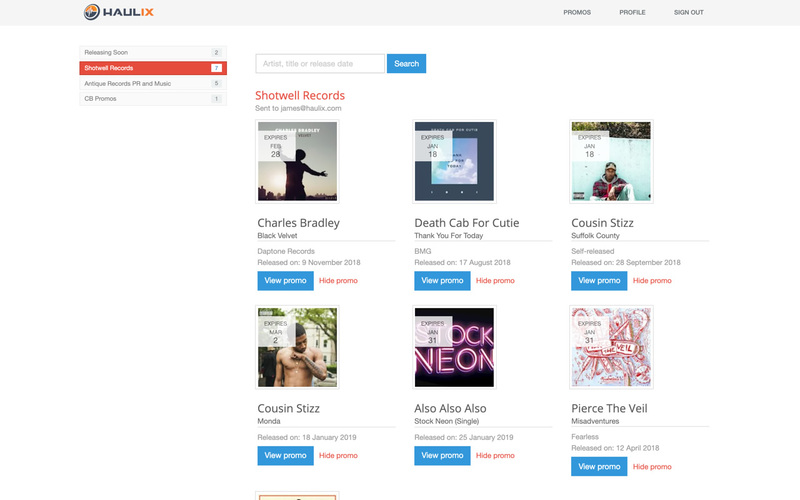 All listeners discover and manage music from their own promo management library . You can easily add material to your contacts' library, even without sending an email invitation. Their promos are protected by a 4-digit passcode in addition to our other layers of security.